Are you ready to have complete control of all aspects of your retail business? Are you ready for a solution that seamlessly integrates with your existing ERP to provide an end-to-end suite of retail management applications? Are you ready to provide your shoppers a smooth, in-store & online shopping experience they desire? Then you are ready for a complete, omnichannel solution that offers greater transparency and flexibility over your daily retail operations. iVend Retail is an enterprise-class, omnichannel retail management solution designed for SME Retailers that works alongside many common ERPs. iVend Retail is used in over 1,500 retailers in 85+ countries to empower retailers to better manage their day-to-day store operations. 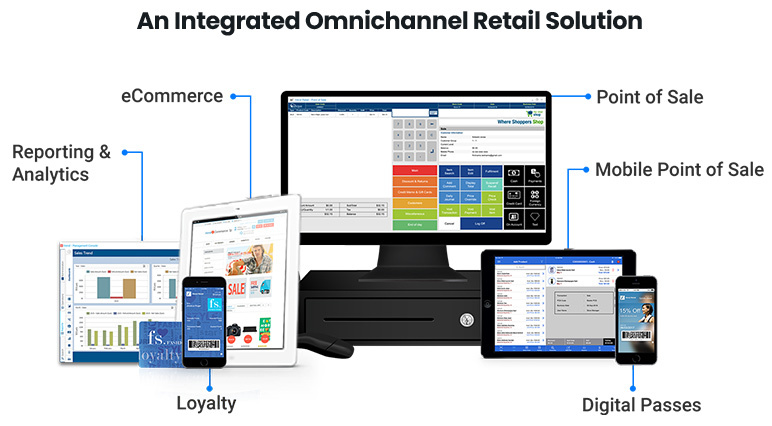 iVend Retail is the most complete out of the box omnichannel solution, covering everything from Point of Sale to back office to head office operations with integrated mobile POS, eCommerce, digital coupons, passes and a customer loyalty program. iVend Retail can be set up for a single store or for a geography-spanning, multi-store environment. iVend Retail automates the entire retail processes, virtually eliminating paperwork and helping retailers increase revenue, build customer loyalty, reach new customers and lower their operating costs. iVend Enterprise is the core of the iVend Retail solution – the central repository from where master data is disseminated across the business, all the transactions get accumulated and the database gets maintained. This module defines key statistics – including sales forecasting, replenishment planning, promotions, gift cards, loyalty schemes and more – and replicates information across the entire retail estate. iVend Enterprise also collates transactions, such as sales, refunds, returns and store credits, to provide essential business insights. iVend POS is an enterprise class point of sale system trusted by thousands of retailers in 46 countries. It powers brick and mortar stores as a full service, point of service solution and includes functionality like loyalty integration, inventory management, merchandising and even offline operations. iVend Retail POS also enables retailers to maximize sales, gross margin and profits by achieving every possible sale using inventory anywhere in the retailer’s network, even when it is a long way from the customer. The iVend eCommerce module is a feature rich eCommerce and mCommerce platform that allows retailers to easily launch new sales channels in different countries or replace existing eCommerce engines with advanced functionality and a better customer experience. As an integrated part of the omnichannel suite, iVend eCommerce extends a retailer’s reach by taking his business online. Besides powering the retailer’s brand presence online, iVend Ecommerce also integrates the suite’s points-and-reward management application. iVend Loyalty is a points and reward application designed to significantly improve customer acquisition, engagement and retention to develop long lasting loyalty. This is done by using customer insights gained from the data to build the “offers” that work best for customers. iVend Loyalty allows reward programmes to be configured effortlessly and executed on iVend Retail itself. This adds tremendous value to any retail business who wishes to get repeat customers. iVend Reporting and Analytics is a comprehensive suite of reporting and analysis capabilities including customizable dashboards and reports, to provide timely and actionable information to Operations teams across channels. Seamlessly integrated into iVend Retail, iVend Reporting and Analytics leverages transactional data of the overall retail environment to generate context-specific detailed insight, which is functional and actionable. Well suited for midsized retail businesses, iVend Retail management suite integrated with Sage ERP helps retailers adopt Omnichannel capabilities with ease. The seamless integration between iVend Retail and Sage ERP provides end-to-end retail management with minimal manual intervention and streamlined retail functionality. Retailers can deliver a great shopping experience, with an enterprise ready Omnichannel solution that is mobile, digital and global.